This verse contains a prayer rendered towards Divya Prabandham or Dramidopanishad. The word देवी comes from the root दिवु. दिवु – क्रीडाविजिगीषाव्यवहारद्युतिस्तुतिमोदमदस्वप्नकान्तिगतिषु | Of the several meanings provided, the one of interest here is स्तुति or praise. देवी is the body of hymns that sheds light on the glory of the Lord through praises. देवी is adjectivated by the word दूर्वा. It means that which is lush green. The hymns of the Azhwars are called பசுந்தமிழ் or evergreen thamizh. This is an indication that this body of hymns does not contain the heat that is usually associated with Sanskrit hymns but the greenery of Thamizh. सहस्रपरमा – that which has the thousand hymns (of Swami Nammazhwar) as the most important section. This is noted in the Acharya Hrdaya Sutram : வேதங்களில் பௌருஷ மானவ கீதா வைஷ்ணவங்கள்போலே, அருளிச்செயல் ஸாரம். The Purusha Suktham in the Vedas, Manu’s among Dharma Sastrams, Gita in Mahabharatham and Vishnu Puranam among the Puranams are considered significant; in the same way, Thiruvaimozhi is considered the most significant section / essence of Dravida Veda (Aruliccheyal). शतमूला – which has its basis in hundred hymns. 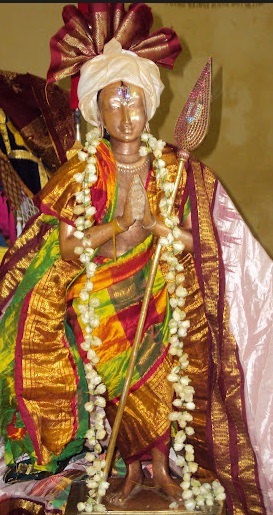 The basis of the thousand hymns of Thiruvaimozhi is the prabandham of Thiruviruththam with a hundred hymns. Swami Azhagiya Manavala Perumal explains this in Acharya Hrdayam – ருக் ஸாமத்தாலே ஸரஸமாய் ஸ்தோபத்தாலே பரம்புமாபோலே சொல்லார்தொடையல் இசை கூட்ட அமர்சுவையாயிரமாயிற்று. When Rig Vedam is sung in musical format embellished with interjections, it transforms into Sama Vedam. In the same manner, when the hundred hymns of Thiruviruththam were sung with music they spread as the thousand sweet hymns of Thiruvaimozhi. Therefore, the hundred hymns of Thiruviruththam form the basis for Thiruvaimozhi, and hence it is शतमूला. शताङ्कुरा – That which sprouted from a hundred hymns. 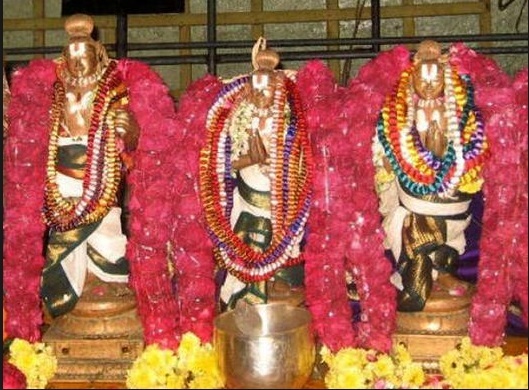 The entire Divya Prabandham originated with the hundred hymns of Mudhal Thiruvandadi, Irandam Thiruvandadi and Mundram Thiruvandadi of the Mudhalazhwars. What is the nature of Divya Prabandham? दुस्स्वप्न-नाशिनी – It destroys bad dreams. The dreams are not those one gets while sleeping. Thirumangai Azhwar says “ஊமனார்கண்ட கனவிலும் பழுதாயொழிந்தன – The days spent without knowing the Lord are more wasted than the dreams of the dumb”. The dream state is the state in which one has little awareness. In the same manner, the days spent without being aware of the Lord are like a bad dream. The dream is bad because as long as one does not become aware of the Lord, one spends time in endless suffering. The Dravida Veda enlightens the souls about the Lord and destroys the effects of samsaram. In Thiruvaimozhi, Swami Nammazhwar says, “இப்பத்தினால் சன்மம் முடிவெய்தி நாசங்கண்டீர்களெங்கானலே. The deceptive mirage-like samsara is destroyed by this decade of hymns.” For those enlightened by Dravida Veda, samsara which is like a bad dream is destroyed. सर्वं हरतु मे पापं – मे सर्वं पापं हरतु Destroy all my sins. Sins are the obstacles to realization of tatva-hita-purushartha. This a prayer to destroy such sins. In summary, the verse prays that the evergreen Dravida Veda remove the sins of the reciter. The Divya Prabandham speaks of the glory of the Lord. It has the thousand hymns of Thiruvaimozhi as its most significant section that expanded from the hundred hymns of Thiruviruttham. It sprouted from the hundred-hymn-Thiruvandadis of Mudalazhvars and is the destroyer of the nightmare of samsara. 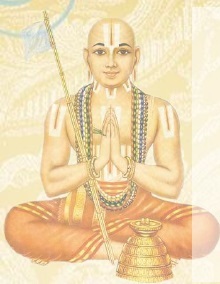 I, Venkatesa, requested by pure-hearted wise men who are desirous of enjoying the riches, churn by intellect the milky-ocean like Upanishad of Swami Satakopa, which is the resting-couch of the ever youthful Srimannarayana, and whose waves arise as the sweet thousand hymns originating from the gem-like auspicious attributes of the Lord. The discussion on the glory of Dravida Veda as explained by the Vedas is concluded. This entry was posted in Dramidopanishat on February 1, 2018 by brd01.